We’d love your help. Let us know what’s wrong with this preview of The Order of Things by Graham Hurley. To ask other readers questions about The Order of Things, please sign up. If you love reading, read this. But t If you love reading, read this. This book is stuffed with unexamined biases. Suttle demonises a "bull dyke" for being predatory and (horror of horrors, fat) and Lizzie, a writer/journalist in her 30s, carries on as if she's about to be raped by same over a dinner. And Suttle's partner beats a dog to death with a baseball bat. Did Graham Hurley really intend to make Suttle, and his policeman and his estranged wife, Lizzie, quite so repellent? This is a steady and entertaining crime mystery story. Set around Exeter in the time just after their floods a couple of years ago, the police try to solve a particularly gruesome murder with the help of the book's heroine, the lead detective's ex-wife, Lizzie. There is enough going on otherwise to make this more than a standard murder mystery, centring around relationships between the police officers, and the surrounding cast. Also, and of most interest, is the climate change link. The murder w This is a steady and entertaining crime mystery story. Set around Exeter in the time just after their floods a couple of years ago, the police try to solve a particularly gruesome murder with the help of the book's heroine, the lead detective's ex-wife, Lizzie. There is enough going on otherwise to make this more than a standard murder mystery, centring around relationships between the police officers, and the surrounding cast. Also, and of most interest, is the climate change link. The murder was in the house of a scientist renowned for his views on climate change, and he is the chief suspect. I always try to find a quiet place to read Graham Hurleys' novels, uninterrupted, as he always gives the reader something to reflect upon as well as a gripping plot and believable characters - both good and bad. 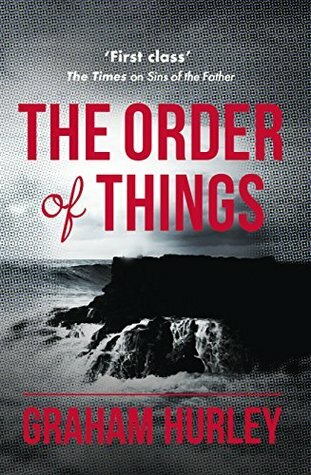 In the "Order of Things", Jimmy Suttle is part of the team investigating the shocking and sickening murder of a woman. She is found in her partner's bedroom and he has disappeared. The police procedures are expertly written (as usual) and they seem sharper in that they focus on one case to I always try to find a quiet place to read Graham Hurleys' novels, uninterrupted, as he always gives the reader something to reflect upon as well as a gripping plot and believable characters - both good and bad. The police procedures are expertly written (as usual) and they seem sharper in that they focus on one case to be resolved. I found this to be more exciting than last novel. It moves along at a good pace as Jimmy (and the Police Team) and Lizzie, his estranged reporter wife, unearth information at different times. In "Sins of the Father", I felt that I didn't really understand Jimmy but in this novel he becomes a sturdier character. He has personal struggles and the fact that he veers from doing the right thing to the wrong thing at times brought him alive for me. His estranged wife is still managing to invade his work and home life driven to get her reporter's story and complicates things for Jimmy in both parts of his life. A magnificent book. Once again the author shows what can be done within the basic police procedural format. In my view he is criminally under-rated. The vicious murder of a local GP in a small village outside Exeter leads the reader into a labyrinthine plot involving climate scientists and voluntary euthanasia. Thought provoking and intelligent, with well-drawn characters and a sympathetic protagonist in DS Jimmy Suttle, The Oder of Things will live long in the memory. WOW this mystery has it all! If you are interested in climate change...and its fallout for mankind you will love this book. Graham Hurley always provides a rewarding read, an ignore-the-world-until-you're finished kind of read. Jimmy Suttle has to solve a brutal murder, negotiate a complicated relationship involving his girlfriend and his nearly-ex wife, while having a crash course on the politics of climate change. A compelling, involving story, perfect for a long journey .... or to keep you turning the pages, far into the night. Another powerful compelling book from this author. Although the main story is on the police investigation of a brutal murder the author also deals with climate change and assisted dying. As ever the author does awful things to his main characters and the ending is shocking. I've enjoyed Graham Hurley's writing since the early days of the Joe Faraday series. In this book, although the setting is portrayed as wonderfully as always, I found the plot somewhat forced and several of the characters almost over-the -top caricatures. Not bad. It is a bit difficult as Hurley moves back and forth between Suttles investigation and his wife's. As well the is a lot of their personal lives that are not of much relevance. His plots are getting steadily sicker, one needs a strange mind to write like this! Entertaining and well-written as all Graham Hurley's book are. This read our of sequence for having been bought, with relief, on holiday in Australia - how expensive books are there! Graham Hurley is one of those writer who just gets better and better. I was afraid that with demise of Joe Farady that I would lose interest, but he has managed to transfer all the interest and energy from the earlier books to the Jimmy Suttle series. Hurley manages to lift the standard police procedural from the mundane and use it as a vehicle to address deeper questions than "Who done it?" part of his attraction I suppose. This is a great tale which will keep you on the edge of your seat until Graham Hurley is one of those writer who just gets better and better. I was afraid that with demise of Joe Farady that I would lose interest, but he has managed to transfer all the interest and energy from the earlier books to the Jimmy Suttle series. This is a great tale which will keep you on the edge of your seat until the very last minute. Since it is well written, fast paced and packed with incident it is ideal for devouring in a single session. D/S JIMMY SUTTLE lives with the loss of a child. A marriage that fell apart. However life goes on. But Lizzie his former wife is a writer and a journalist. But a brutal murder happen in this pretty Devon village. We learned from many pages that the main characters are not very stable. "Lizzie in the nightmare months after her daughter died she'd lost all faith in redemption"
Alois Bentner a climatologist,brilliant----but often quite drunk is missing. His partner GP Harriet Reilly was found mutilated-- D/S JIMMY SUTTLE lives with the loss of a child. A marriage that fell apart. His partner GP Harriet Reilly was found mutilated----and pregnant. degrees-also very brilliant.But she was a little nuts. Welcome to----THE ORDER OF THINGS. Throughly enjoyed this book, it's always enjoyable reading books set in your local area, in this case Lympstone. Compared to most crime fiction where the number of bodies mount up as the cops investigate the case this is only about one (or two) murders and revolves a lot around Suttle's private life. The plot line around salmon was very interesting especially on reflection after reading the afterword. This started out as an acceptable, if unremarkable, murder mystery. At least it wasn't jumping about in time. But I'm afraid it deteriorated. None of the characters are credible or even likeable, and the plot is daft. a bit grisly but this is life. Always enjoy Graham Hurleys books, but thought the plot in this one a little contrived. Despite that it's a good read. Directed and produced documentaries for ITV through two decades, winning a number of national and international awards. Launched a wr Graham Hurley was born November, 1946 in Clacton-on-Sea, Essex. His seaside childhood was punctuated by football, swimming, afternoons on the dodgems, run-ins with the police, multiple raids on the local library - plus near-total immersion in English post-war movies.